ED Note - Lyall Payne is one of our senior breed historians. In addition to his deep knowledge of breed history, Lyall excels at researching the people in the breed. Today, 6th July 2013 Lyall posted on the afghanbreeders (Yahoo) forum a very well researched and interesting biographical summary about Mrs Phyllis Robson and he agreed for me to publish his summary here on AHT. Expecting to do a brief edit to Lyalls notes, not altering his content, just a slight re-formatting anticipated, I needed to add/check some dates, and happened upon an exciting discovery. So I am piggybacking my research findings on the back of Lyalls original notes. Let's kick off with Lyalls forum post summary first..
Mrs Phyllis Robson was for some time the Editor of the UK Dog World weekly canine newspaper, and the first Chairman of the Afghan Hound Association (AHA), the longest serving (surviving) Afghan hound breed club in the World. She was a great supporter of G But, Mrs Phyllis Robson was never Mrs Phyllis Robson at all. She was in fact Miss Phyllis Robson. I’ll come back to this. At the time of the First World War she was appointed Editor of the UK Dog World magazine, she stated it was because all the men were drafted to war and the opportunity fell to her. She held the position through the second World War and subsequently continued to report and write for Dog World for many years afterward as she travelled widely and reported on ‘dog matters’ in both the UK and the USA on a regular basis. She crossed the Atlantic (by sea) more frequently than many of us (combined) are likely to hazni type afghan hounds, her own Ch Asri Havid of Ghazni was the first black and tan champion in the afghan hound breed. An imposing figure – she stood five feet ten and a half inches tall (1.79 metres). have done by air today! After crossing in 1935, 1936, 1937, 1938 and 1939, World War 2 broke out and she was ‘stranded’ in the US and Canada for six and a half years. Her niece Mrs Mary Paisley lived (in Toronto). But to back up a little. Phyllis Robson (born 17 April 1877) grew up in a very affluent part of Newcastle-Upon-Tyne. Her father was a cabinet maker. One that employed 123 men, 28 boys and 14 women that is (in 1881)! Her eldest brother, Richard emigrated to Perth, Western Australia, where he became a Minister in the Western Australian legislature. A controversial figure in politics, Richard made claims of corruption in government and although eventually apologising for inferred individual’s misdemeanours he refused to withdraw parliamentary made claims of corruption at the highest levels of state government. Claims he made both inside the House (with parliamentary privilege) and outside – where he could be sued for such comments (though he never was). Richard married in Australia and was to have five children (including the aforementioned Mrs Mary Paisley who was born in Geraldton, West Australia). In 1900, Richard apologised, resigned from Parliament and left Australia. He signed up for the Boer War in South Africa and led the Australian Contingent of Mounted Constabulary there, earned the Queen’s Medal, was Justice of the Peace for Bethel District and then returned to Newcastle in England to become a cabinet maker in partnership with his brother (Phyllis’s father). He died at sea on 30 November 1928 while heading back to Australia. While Phyllis was in the States and Canada during WW2 her London home was severely damaged during the Blitz (the German bombing raids on London) and her home in the Kentish countryside was annihilated. 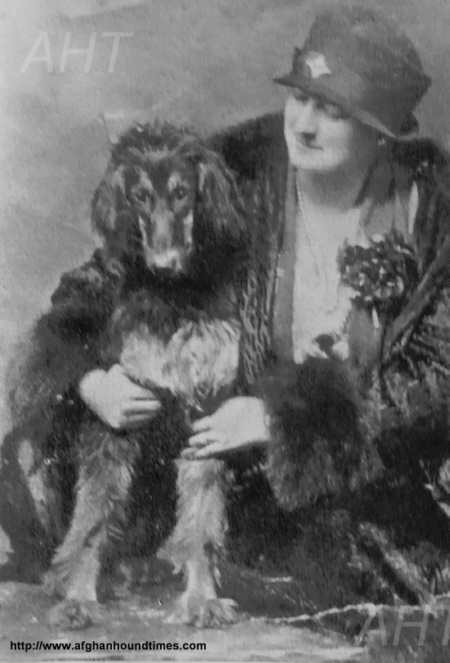 Phyllis’ first afghan hound was the breeds first black and tan champion – Ch Asri-Havid of Ghazni, who was whelped in 1927. In 1899 Phyllis married Victor Philip James Grunhut (1866-1962) and had a son (Victor Stephenson Grunhut 1901-1933). In 1919, she married again – Duncan Gordon MacPherson – at St Martin’s Registry Office in London. Thus explaining her frequent use of dual surnames of Robson and MacPherson on her travel documents, even to the extent of her will as Miss Phyllis MacPherson, spinster, leaving 41,982 pounds 17 shillings and 1 penny to John Edgar Robson – Mrs Mary Paisley’s brother who was also born in Geraldton, West Australia but returned to live in Newcastle Upon Tyne as his father (Phyllis’s brother) had done also. Incidentally, he (nephew John Edgar Robson) died at sea while travelling out to Australia in 1965, just as his father had all those years before him ! "The plaintiff's wife had for many years edited and had a proprietary interest in "The Dog World" and used the name Phyllis Robson"
While in the United States, Phyllis attended such shows as the great Morris and Essex Show, and stayed at some of the big US kennels. From May 1941 to August 1941 she stayed with Mrs James Austin at the Catawba kennels in Old Westbury, Long Island (incidentally Howard Stern, judge on America’s got talent today, current home is at the entrance to Catawba Farms). For added insight, I recommend a book ‘Champion of Champions’ by Don Reynolds – the story of Nornay Saddler (wire-haired fox terrier) owned by James Austin and winner of BIS Morris and Essex KC 1941 where Phyllis was in attendance. This book is riddled with names familiar to ‘dog historians’. Incidentally, its worth taking a minute to Google the name of this fox terrier and look at his ‘images’ if you get the chance. Phyllis also visited Sunny Shay, was impressed with the spacious acreage the dog’s had to exercise in and was delighted that Sunny named a puppy Asri-Havid of Grandeur in honour of her own famous Eng Ch Asri-Havid of Ghazni. Mrs Phyllis Robson (as she will always be known) traversed the Atlantic at the ages of 80 and 81. She was, apparently, by then well-known to staff of the luxury liner ‘Queen Elizabeth’. Phyllis passed away on 16 November 1959 at her home 12 Smith Street, Sloane Square, London. She was 82 years old. 2.2 Phyllis Robson and "Dog World"
The weekly English canine newspaper "Dog World" dates back to the beginning of the 20th century. Mrs Robson was involved with "Dog World" when she became the manager when it changed its title from "The Country World and Kennel News" to "Dog World" in 1918. It is a specialist newspaper dedicated to the interests of pedigree dog fanciers as well as general dog owners. One of the all time longest serving editors was Mrs Phyllis Robson who was editor in the 1930's - 1940's. Mrs Robson bred Bulldogs but is more well known for her famous Afghan hound - Ch. Asri-Havid of Ghazni, gifted to her by Mrs Mary Amps (Ghazni Afghan Hounds). Mrs Robson has been described by Bo Bengston as the "one of the emerging dog world's first international celebrities." Mrs Robson authored the book "The Dog World in 1927, a Retrospect, and also the book "Popular Dogs - the Breeds, Their Care and Management - a Guide for the Novice and Others. published in 1934. Mr. & Mrs. Zeppo Marx. Christmas 1931." I (Steve) have been very fortunate to obtain from a UK bookstore website, a copy of her book on sale, described as follows "Book Description: Popular Dogs Publishing Company Ltd. Nd (ca 1931), London, 1931. Cloth. Book Condition: Very Good. First edition. Sm. 8vo. 386pp. Indices. Illustrated with numerous photos and drawings. Orig. blue cloth gilt, spine lightly faded and some fraying at extremities. A presentation copy inscribed on the title page by Phyllis Robson, "To my two dear friends, Mr. & Mrs. Zeppo Marx. Christmas 1931." From the library of Zeppo Marx. Phyllis Robson was the editor of "Dog World" magazine in the 1930s and 40s. Signed by Author(s). Bookseller Inventory # 679". The book is a pre-publiction edition (pre dating the formal 1st edition by some 3 years). We must have talked for half an hour and I drew up a list of kennels I suggested I would visit with them and then somehow California was mentioned and the young man siad, "You know I only work six months in the year." "Aren't you lucky," I replied, and just what do you work at?" He said "Films," so I said, "Do you mind telling me your name" He said "Marx". Then knowledge came to me as the Marx Brothrs were fulfilling a contract in London and I said "Dont tell me you are one of the Marx Brothers." To which he replied "Yes I am, I am Zeppo." So I replied "Well, don't you mention your name when you go round the kennels, we'll ask prices and if they are too high I will tip you the wink." We started off early on a Sunday morning and first brought Asra, and finished up at the Westmill Kennels where Mr and Mrs Marx fell in love with Omar. I little thought how prominent a part these dogs would play in Afghan history - I warned the Marx's that the coats would reuire a lot of attention and I think this was the cause of their parting with them later on. These sales did the breed a lot of good in England as they got any amount of publicity and all the London papers carried pictures of Mr and Mrs Marx walking in Hyde Park with their Afghans and they even appeared on the stage with them. Incidentally I lent them my own champion to be photographed with and was reproached that I should have sold a dog I loved so dearly - till I explained. Mrs Robson and Mrs Mary Amps (Ghazni) were close friends, as evidenced by the gift of the Afghan hound Ch Asri-Havid Of Ghazni by Mary Amps to Phyllis Robson. Additionally, both Mary Amps and Phyllis Robson were founder members of The Afghan Hound Association and members of the 1946 AHA Breed Standards commitee that drew up a different standard to the then already existing breed standard produced by the Afghan Hound Club (Bell-Murray fanciers) two decades earlier. It is interesting to think about the "people dynamics" going on here in the story of Zeppo Marks and his two Afghan hounds. Phyllis Robson was editor and "reporter" for "Dog World", the weekly UK canine newspaper that was read all around the world. As a "reporter" one might have expected some "neutrality" or even-handedness from Phyllis Robson, ie, not favouring Ghazni or Bell Murray, but treating them equally. On the other hand, she was skillfully and brilliantly recruited into the Ghazni camp by that gift of an Afghan hound from Mary Amps. So... when Zeppo Marx comes knocking on Phyllis Robsons office door asking for help in finding some Afghan hounds to take back to America - Phyllis Robson could have taken Zeppo to a Bell Murray type breeder as well? But, no, she only took Zeppo to Ghazni breeders. Effectively (albeit unknowingly to her at the time) Phyllis Robson single handledly determined the foundations of the breed in America. Had Phyllis Robson included Bell Murray type in her considerations, the foundations of the breed in America would have been quite different.